Our web store is currently closed. Check out our reseller's web store in the Netherlands. Like most women, NJ Carson, was tired of always digging in her purse. She did something about it and invented the Purseket® (short for Purse Pocket), the ultimate purse organizer. "In the black pit of my purse - no matter what kind of purse - deep, shallow, skinny, fat, soft, hard, cheap, expensive, interior pockets or not, it was always a hair pulling episode to find anything. The phone? The keys?" - Sounds familiar right? "I went to my sewing machine and devised the first prototype with some left over orange linen." Like all the best ideas Purseket® is a very simple one - a removable set of pockets that can be transfered from handbag to handbag. NJ currently resides in Rye, New York but is originally from New Orleans where she first learned to sew to pass the time. "In the deep South we had long, hot days without television or air conditioning, we had to be creative in order to pass the time. I learned how to sew and make clothes for my dolls," NJ explains. "I have always been involved in something from designing tennis dresses, running an upholstery business to decorative/faux painting until I became highly allergic to paints. I came to a crossroads when I had children - you don't get a second chance to raise your children. I could start another business anytime." Out of her home in Rye, New York, NJ (often refered to as the Dr Ruth of handbags) invented a product that was to become the ultimate solution to the everyday female problem of purse organizing. "I was real tired of constantly digging in my purse." said NJ, "The first purse organizer I made was for myself. I used it for several years then made them as presents for friends. They loved them and gave me resounding encouragement.". Since 2001, Purseket® has grown from a small home-based business in Rye, NY to a market leader in purse organization, giving women across the globe an elegant and chic solution to organizing their purses. Purseket® - The Original Purse Organizer™ has been featured on TV - in network stations' style and trend segments as well as on the Oprah show, the Today Show and the View, and in numerous magazines and newspapers including RedBook, Better Homes and Gardens, USA Today and Real Simple. 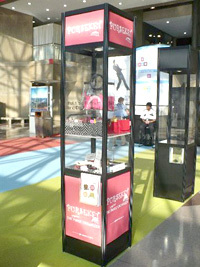 Purseket® was also awarded Best Travel Product 2007 by Orca Communications.